The gold guinea was, for almost 150 years, the standard gold coin of the British currency. Originally, it was valued at £1 (twenty shillings). It became known as the Guinea because it was first minted from gold brought to England from the Guinea Coast of Africa. Hence, it was called the Guinea-Pound. 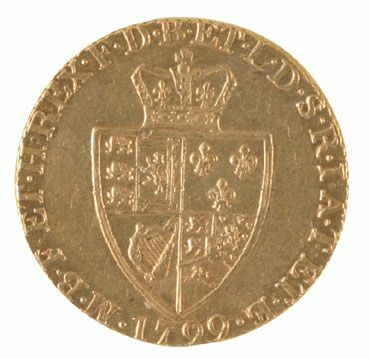 From the 1717, its value rose to twenty-one shillings due to an increase in the value of gold in each coin. The Guinea was minted between 1663 and 1799 (although a military commemorative issue was made in 1813). From 1817 onwards the Sovereign took its place as the premier British gold coin. George III Guineas Under George III the guinea was the basis of the gold coinage. The type we offer here is known as the Spade Guinea, after the 'shovel' shaped shield on the reverse. 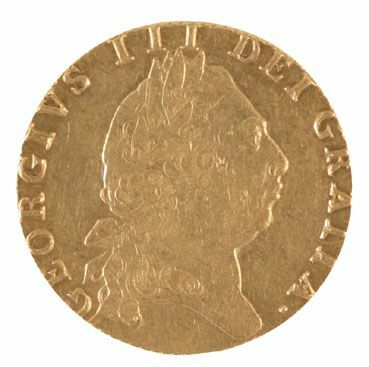 This type of Guinea was minted between 1787 and 1799. During the 60 year reign of George III, six different portraits of the king were used on the guinea coinage. By the year 1812 the gold in a guinea was worth 27 shillings (6 shillings above its face value) and it became widely hoarded.